FWIW, in the beggining of this year, when price went down to 90$, I did say that price would go down to 100$ again in the summer, which implied another run-up to 120$s. It were numbers that I took from you-know-where. Doesn't matter in the long run. High prices are here to stay. Perhaps, the markets are fully realising this, and thus paying extra for it, and only when reserves truly build up do they acknowledge that the price went too far. But I also took this out-of-you-know-where. I'm not sure this data is useful for this purpose. I believe this data is simply intended to show how supply and consumption are distributed, not to measure potential, or maximum supply. Supply always matches consumption ("demand") - as best I can tell the discrepancies between the two are simply statistical errors. For instance, previous EIA reports show that 2002 demand exceeded supply. How can a site that debunks Peak Oil believe that oil will peak? THAT'S idiotic. The oil drum has posted a good insight into backwardation and contango in oil markets. Worth read. Crude oil and heating oil climbed to records on signs that refiners are not meeting demand for distillate fuels such as diesel and heating oil. Supplies of distillates in developed countries fell 6.7 percent to 477.6 million barrels in March from last year, according to International Energy Agency estimates. U.S. distillate supplies in the week ended May 2 were 2.6 percent below the five-year average, the Energy Department said May 7. Refiners have struggled to increase diesel output since 2006 when the U.S. Environmental Protection Agency instituted requirements for the fuel to contain less sulfur. The IEA, an energy adviser to 27 nations, said global oil supply averaged 86.8 million barrels a day in April, down 400,000 barrels from March. I'm still not convinced every twitch in the market has to have a reasonable explanation though. Only the basics need to follow the rules. The numbers are misleading. First of all, "Oil" supply is not currently running at 87 mbd. That is the total supply of liquid hydrocarbons (a chunk of that is actually gas liquids and unconventional oil). Secondly, the price graph you have is for "light sweet crude". The production of that has been flat since 2005 (and a flattening was imminent to some in the market - which caused the flow of funds into oil and the price spike since 2002). Actually in 2002 there was a strike by oil workers in Venezuela which caused prices to spike up back then. Anyway, my point is that the crux of your argument is fundamentally wrong - you are showing a graph for light sweet crude and then showing production numbers for liquids. The two are not the same. There are many who are dreaming that oil prices will see a massive correction. This won't happen. The basic fact is that even if we could keep increasing liquids production (and I believe we will - there is still a ton of natural gas around which can be turned into liquids as we have been doing in the last four years), the cost of extraction, purification and bringing it onto market has absolutely gone through the roof. A friend of mine who is an oil trader told me that an offshore rig that used to cost $45,000 a day less than a decade ago now costs $600,000 a day. The costs have simply gone into the stratosphere. What this means is that even if we do not hit peak liquids any time soon, the cost of bringing more liquids production to market will keep rising. Secondly, 54 oil producing countries are now in decline. The market has factored this in as well to some extent. In other words, keeping production flat for the next decade will be a massive challenge. Dollar inflation also makes this worse. 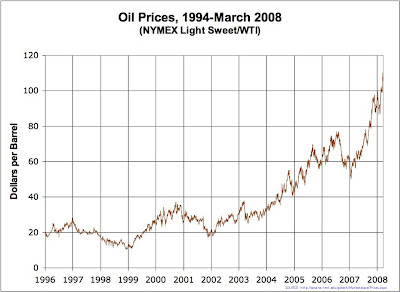 Your graph is interesting because it shows a massive spike in oil prices just a few months after 9-11. Remember that Alan Greenspan cut interest rates down to 1 percent in Semptember 2001 (the lowest rates I can remember in living momory). So you had a classic flow of money into commodities from easy money (although most of it went into housing). You cannot accept the reality of peak oil and then wonder why oil is expensive. Markets do not wait until peak oil happens. They price it in well in advance. This is happening to oil. The fact is that the backwardation in oil prices for futures after 2009 is a massive investment opportunity. This will disappear soon as it becomes obvious that it will be hard to keep production going at current volumes. It is a fascinating subject - but to my mind the argument that prices make no sense doesn't hold water. If this was a bubble, there have been plenty of occasions when the bubble could have popped. We have seen 10 percent corrections in the matter of a day or two but the bull market keeps going. This is quite different from the 1980s when supply far exceeded demand and caused prices to crash - $40 oil was really a massive bubble. $127 oil is not a bubble - funnily enough. "How can a site that debunks Peak Oil believe that oil will peak? THAT'S idiotic." The fact that oil extraction rates will reach a peak at some point is a fact so trivial it is only challenged by abiogenic oil fruit-loops. There is a a lot of agenda driven bunkum that tries to hide under the umbrella of peak oil that doesn't really belong there and doesn't follow from the premise that oil will peak at some point. People who desperately hope for peak oil to be the restorative event that will finally bring man into line with nature and usher in die-offs(not of them of course, just those evil industrialists), a return to manual labour and subsistence farming in some kind of new-agrarian, hippie utopia. I think that the most important part of this is that, as the oil drum post I linked upwards points out, the market has entered contango. That means that for the first time, oil in 2015 is more expensive than oil today. For the more distracted, that's a key argument against the speculator's driven price surge. In fact, it can become a changing paradigm event. luis: Just so folks don't get confused.The oil market has been in contango before, most recently from Jan. 2005-Summer 2007.
soylent: Nicely put. Thank you. You don't understand how bull markets work in a commodity like oil. Shortages actually can kill a bull market, as demand destruction emerges as a force of its own, and goes on a rampage causing economic havoc. A bull market in oil, rather, is created and sustained when the spread between supply and demand narrows. Whenever I hear someone say "there are no shortages" as a point to support their view that there should be no bull market in oil--I know straight away they don't understand. The bottom line is that oil can go to 300.00 on a sustained narrowing of the spread between supply and demand. It's the existence of, and the awareness of, diminishing spare capacity that creates a bull market. If I was long oil futures and learned that actual shortages were cropping up on several continents, I would sell immediately, wait for a large pullback, and then get long again. Your inability to understand all of this is a combination of intellectual ability to understand multi-factorial phenomenon--and--self-imposed intellectual barriers. In short, you are a plodding, linear thinker and when oil is at 300.00 you still won't get it. Which light sweet since if WTI, I believe its production has not been flat but declining and sufficiently so as to raise questions about its suitability as a benchmark crude oil, i.e. an increasingly thinner market and fewer actual deliveries. I believe the same applied as well for Brent but then they added Ninian, etc, in an effort to generate sufficient shipments. Not sure that this worked. Also Dubai which became Dubai-Oman and again not sure but think that market has also (re)thinned. As presently set up, the whole benchmarks and reference formula structure has become questionable which, I gather, is one main reason price formation increasingly shifted into financial markets. At an extreme, its possible to run a market in prices even if none of that being priced exists, which would be a perfect disconnect or, better, a purely speculative market. Last week, a close friend who drilled the Illinois Basin during the 1950-86 period pointed out that one approximately 4000' NW Kentucky well into I can't recall which sand formation, had a total cost of $25-30 thousand, and owing to high formation porosity and pressure came in at 1000 b/d. This was in the early 1950s when, I believe, nominal price recieved was right around $2.50/bl, so, even with that well throttled back, it paid off in less than a week. I should mention that max production was down to 200 b/d six months later and around 35 after a year but it produced for years with no secondary recovery, during which time a field was developed and finally placed on water flood in the late 1960s. It may still be producing. Simple curiosity but have you ever looked into IEA methodologies? The demand figures from IEA are meaningless, they are just someone's WAG, you can't deduce anything sensible from them. And if you think that the price should only rise if there is a "shortage", then you have no clue what you are talking about. Writing about not yet peaking oil is just like giving a drug addict marihuana and saying that he must to leave drugs. We should tell everybody about peak oil and start working on the solution. Watch for Nicaragua, they just began their peak oil collapse, so you will have a better picture on what will happend to another countries in a few years. Heh, although peak oil is a sound theory, it's annoying that it's reached the pseudo-religion phase. If something challenges the status quo, it's time to redefine. I want my electric car. And my permaculture food. And my solar/wind heat. try crossing oil prices with OPEC margin production (the oil production that those countries don't need to satisfy international demand). Yes, a strong correlation. No idea how does the market know it but it reacts quite accurately. Well...it's still a gigantic bubble. Unfortunately, I believe that in February we crossed the point of no return for a soft landing for this fast running freight train. To me, the scary thing is that the number of outstanding and unfunded commodity derivatives is so high and so many people are chasing returns that the potential liability of even a 25% oil market correction would be really ugly. The oil futures market looks more and more like a ponsi scheme everyday with exploding volume. Personally, if the oil market rise since 2001-2 had not been accompanied by 5x volume rise of oil futures trading on the NYMEX and god knows how many other contracts on the ICE, the new dubai exchange, etc, I'd be less skeptical of this. In short, this makes the housing bubble look like a kiddie birthday party. I have no clue how the Fed could even begin to clean up after this mess. What sector of the economy has Wall Street not ravaged in the last decade with excess money? I guess we could have another tech bubble since we haven't had one of those in a few years. If oil even corrects by say 25-30% (and even if we are at peak oil and imminent shortages tomorrow, this could very well happen as Simmons, Boone, Jim Rogers, etc. ALWAYS say), this could very well cause hedge funds with less than 5% margins to ditch their paper oil contracts. The unfunded liabilities of these derivatives would demolish the Goldman Sachs' and Morgan Stanley's of the world. So perhaps, I have been WRONG about thinking that the imminent oil correction will be a good thing for the economy. Lets hope that oil continues to go through the roof in order to keep alive the banking system!! Btw...while we're all on the bs train, who wants to predict $250 before the end of the year first? We are in uncharted territory. All predictions are off. The world is full of peaks. Just not one overall peak. Not yet. Not by a long shot. Wow...so we're officially back to Contango all the way to 2016. Even though we have (as all of the sources I've seen indicate) a glut of crude on the market currently and supply forecasts for more oil to arrive this year. It sure doesn't look like the hinges are falling off the door to me. BTW...if you'd like to have some fun, start watching the inventories grow now, b/c the price structure is definitely encouraging it. This looks like the crude oil market is setting itself up for the correction it so desperately needs. The IEA's analysis of demand is anything but wild, or a guess. It isn't perfect, but it's incredibly detailed and informative, and I'd encourage anybody to read their monthly Oil Market Report to see what I mean. I'll take their word over yours anyday. They've done very extensive analysis, while you're just blowing keyboard farts. A: Oil prices are rising because demand is outstripping supply. B: Oh really, how do you know demand is outstripping supply? A: Because prices are rising. Interesting that demand was outstripping supply in 2007. Anyone remember the OPEC production cuts of late 06 (500,000 barrels per day) and early 07 (1.2 million barrels per day) ??? Great stats, JD, although the point is well taken about the graph for light sweet crude. ker, do you see JD's post two comments above your own? Because he refuted your "argument" before you even made it. Yes, peak oil will cause prices to rise. No, not every price increase is attributable to peak oil. According to Frank Veneroso, (Veneroso Associates), total notional commodity derivatives had surpassed $8 trillion in, if I recall, 2006. Again only my recollection but it seemed that what you refer to (impact of unfunded commodity derivative liabilities) started to appear for a few days during Bear's breakdown but stabilized. As you strongly imply, next time will not be so kind but may enter into an unstoppable, credit/commodity derivatives, vicious cycle that will make earlier credit derivatives problems look kind. It has been a few years since I read through them but the IEA's methodologies did not strike me as able to effectively capture what that agency measures. Which, so long as the methodologies are consistent, is not a problem for 'seeing' trends but might be when considering absolute numbers. "According to Frank Veneroso, (Veneroso Associates), total notional commodity derivatives had surpassed $8 trillion in, if I recall, 2006." Considering that Goldman Sachs' & Morgan Stanley's COMBINED market cap might be 0.5 trillion, it wouldn't take a large number of these things to really demolish their balance sheets using 2006 numbers. A .25 trillion dollar hit (or less than 2% default rate on the derivative trade in 2006, which is definitely possible because people buy futures at less than 5-7% margins) would be devastating given what's already happened on the mortgage/credit/private equity side. We as a global society are basically bailing out Wall Street, London, and the other big banking centers for excess of cycles past. Do you have numbers for production vs demand during, say, the 90s when oil was cheap? Because I tend to hear people saying that demand isn't necessarily outstripping supply YET, but since there's so little excess capacity its causing the prices to rise out of fear that demand will outstrip supply IN THE FUTURE, or that one bad event (i.e. oil strike in Nigeria, oil embargo from Iran, etc) will screw the pooch. So basically I'm wondering if in the 90s supply exceeded demand by a much higher margin than it does now. As you can see from this graph, spare capacity has averaged approx. 2.5 million barrels/day since the late 1990s. We hit the low end of spare capacity in 2004-5, and have been building up since. These graphs have been somewhat controversial though b/c there is alot of debate in the peak oil crowd that spare capacity is a myth and that OPEC is lying through their teeth. Hi, i am no expert, but it is said that WTI is light, sweet oil, for which there is high demand. The extra supply is not always of the same quality. Heavy, sour oil is not in demand, and there is undelivered surplus, eg. at Iranian ports. So the total oil supply is not relevant for the WTI price, you should consider oil of WTI quality, eg. Nigerian. So demand isn't ever much higher than production. If the price of gasoline was lower, more people wouldn't drive, because they really aren't "demanding" any more? Not to diss any arabic here, but remember the "quadrupling" in the 1972s? The arab emirates got Israeli supporters in a stick by pricing oil against gold ( and by halting production in some cases.) The price has gone up permanently ever since then( even after the Emirates stopped fussing) so what makes you think it won't now?